Tri-Trang Beach (หาดไตรตรัง)Tri Trang beach is located in a scenic bay South of Patong Beach in front Merlin Beach Resort. The cosy atmosphere and peaceful silence is only interrupted by the occasional longtail boat to and from Freedom Beach. As popular the beach is for snorkeling, Tri Trang is definitely not to be recommended just for swimming, as by low tide there are many rocks in the rather flat seabed. In addition, Tri Trang is very near the popular possibly finest beaches of Phuket, namely Freedom Beach, which can only be accessed by boat. 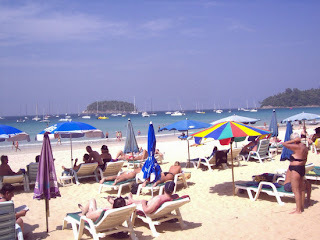 Karon Beach (หาดกะรน)The second largest of Phuket’s main tourist beaches. Many large resort complexes line the road back of the beach, such as Thavorn Palm Beach Resort, Ramada or Hilton Arcadia but the beach itself, long and broad, has no development. Due to its extensive size, and despite being very popular, the beach never is too crowded and there is always ample space between the sun loungers. 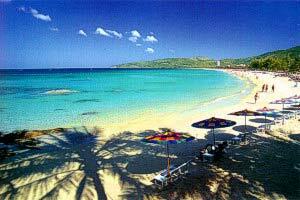 It is therefore a very popular beach for families as well as longer staying travelers. The sand is very white, and squeaks audibly when walked on. The southern point has a fine coral reef stretching toward Kata and Poo Island. Karon Noi Beach (หาดกะรนน้อย) Karon Noi Beach, in the North of Karon, is in principle the private beach of upmarket Le Meridien Resort and Spa and is basically only accessible through the resort. Kata Beach (หาดกะตะ)The smallest of Phuket's three main tourist beaches, Kata is different in appearance and style from Patong or Karon, while only a few minutes drive away. The beach itself is broad and curvy, and structures bordering it are low–rise. Very popular with families, Kata is an all round favourite due to mainly its spectacular palm-lined beach, great restaurants, lively but not raucous nightlife. The clear water is perfect for swimming, and at the north end is a coral reef with a rich variety of colorful tropical fish and corals which stretch out toward Poo Island, about 500m off shore. South of Kata is Kata Noi, a smaller beach with only a few hotels and little other development. 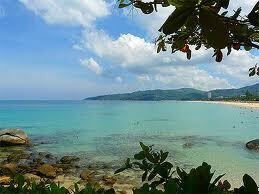 The beach is superb and the scenery is breathtaking from the popular Kata Viewpoint. Swimming can be difficult due to the abundant rocks and corals but Kata Noi has long been a popular spot for surfers during the summer months. To get there take the narrow beach road up over the hill from Kata. Nai Harn Beach (หาดไนหาน)Nai Harn Beach is located South of Kata Noi and north of Promthep Cape. It borders the most gorgeous lagoon on the island, it borders the most gorgeous lagoon on the island, and is therefore definitely worth a visit. 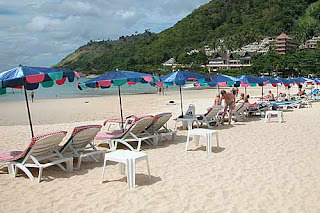 The center of the beach is dominated by the Samnak Song Nai Han monastery, which has obstructed excessive development and is the reason why the beach is generally less crowded than other spots on the southern part of the island. 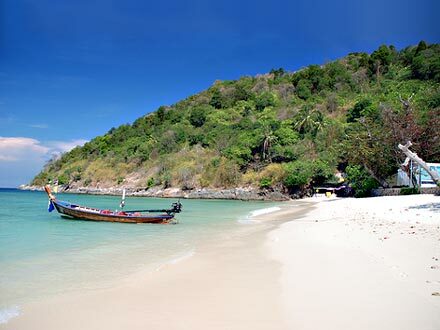 Coral Island or Koh Hae (เกาะเฮ)Coral Island, also known as Koh Hae, is located 9 km southeast of Phuket. Koh Hae is part of a marine park, but accommodations, local restaurants, watersports, and above all diving and snorkeling are widely available. 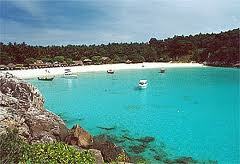 To access the island, boats leave from Rawai beach and Chalong bay. 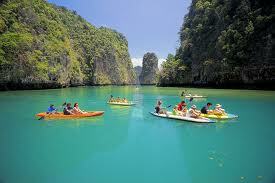 Also, package tours are available, which tend to bing a large amount of day trippers to the island and its reefs. The main attraction of Coral Island is its very rich marine life and is therefore a favourite scuba diving and snorkeling location. Main beaches are Long Beach and the smaller Banana beach. 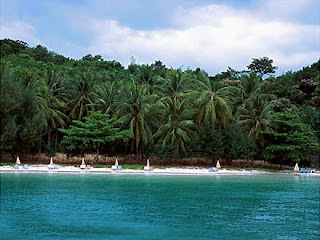 Racha Yai Island (เกาะราชาใหญ่)Racha or Raya Island as sometime refered to consists of Racha Yai and Racha Noi. 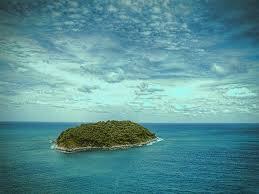 The island is located about 12 KM south of Phuket and can be access by boat, speedboat or though a excursion tour. Mostly travelers are heading to Racha Yai as the west coast is probably the most stunning fine white sand beach available in the area. It is closed in by the hill that stretch away from it like to arms of a horseshoe called alternately Ao Tawan Tok or Ao Bungalow. 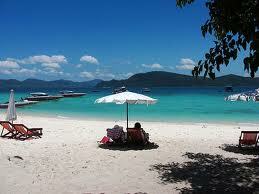 A very clean powdery sandy beach and crystal clear waters of Racha Yai attract day-trippers from Phuket. In the recent years, aside of the original bungalow accommodations, some upmarket resorts have been developed and combining outstanding service with the breathtaking sceneries making Koh Racha a all-time favorite for couple and honeymooners. Rawai Beach (หาดราไวย์)Rawai Beach is the site of the famous Chao Ley or Sea Gipsy villages as well as the very first tourist beach of the island. 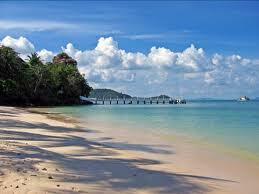 Indeed in the earlier days, the residents of Phuket town would prefer to drive out to Rawai to enjoy the shady Casurina fringed beach rather than take a chance with the hilly and (then) treacherous winding roads across the island's hills to go onto the West shores of Phuket. Many restaurants and bungalows, shell handicraft shops, and both fishing and charter boats to the nearby islands are available in Rawai Beach, which is very suitable for swimming. Rawai is 7 kms. West of Chalong Circle. In the current times, Rawai is more of a transit beach and launching point for day boat excursions out to the numerous islands surrounding Phuket. Many longtail boats are available for hire and trips to Coral Island, Koh Lone or Racha Island. Rawai is home to some of the island's the five-star resorts and has become a very popular living area for foreign residents lending a bit a bohemian and laid-back touch to the area. Lone Island (เกาะโหลน)This large, mountainous island is only 20 minutes by regular passenger boat from Chalong Bay, in the south of Phuket. The mainly Muslim inhabitants engage in fishing, rubber and coconut planting. Else the island has so far not been developed much and is therefore a perfect hideaway for travelers who want to have a break from the hustle and bustle of Phuket’s main touristy and commercial areas. Panwa Cape (แหลมพันวา)The southernmost tip of this cape is home to a Marine Biological Research Center and Phuket's Aquarium where visitors may inspect several hundred exotic and flamboyantly colourful marine species found in the teeming waters of Phuket and elsewhere, comfortably and without risk of getting seasick on a snorkeling trip. It is in principle more of a functional beach – due to both the Marine research center as well as a marine base with a large pier, mainly for commercial and military use. Yao Yai Island (เกาะยาวใหญ่)Yao Yai is the largest island in Koh Yao District and has many interesting beaches, such as Ao Thi Kud, Ao Klong Son, Ao Sai, Lo Pa Raed beach, Ao Laan, Ao Hin Kong, and Laem Nok Og. Lo Jaak pier is an important pier from Koh Yao to Phuket. The water at the pier is clear and schools of fish swim near the bridge at the pier. Visitors can see the production of dried anchovies (pla ching chang) here. There are inexpensive bungalows on the island along with home-stay accommodation with the local people, who make a living by fishery or agriculture, to learn their lifestyle. Attractions of Koh Yao Yai are Loh Jaak Beach and Loh Jaak pier, which is an the main transit point from Koh Yao Yai to Phuket. The beach here is white, and the water is clean and very clear. Visitors can also go fishing or search for shells or see the production process of making dried anchovies (pla ching chang). Long-tail boats can be hired to go to Koh Kai Nok or Koh Kai Nai. There are two trips leaving the pier to Phuket everyday at 8 pm and 2 pm daily. Yao Noi Island (เกาะยาวน้อย)Koh Yao Noi is one of the larger islands in Phang Nga Bay, an archipelago of 44 islands. It is easily accessible from both Phuket and Krabi Provinces and sports some of the most beautiful sea scenery in South East Asia. Great for bicycling and walking, the island covers about 50 square kilometers and has about 18 kilometers of dirt track and concrete road around. There are a few hotels developed in the last years ranging from budget to a high end exclusive resort. 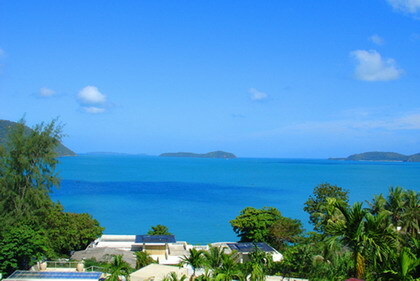 As one of the major island, Koh Yao Noi is home the District Administration office as well as to a hospital, several schools and a post office. 24 hour electricity supply, Internet access, mobile telephone connection and ATMs are available. 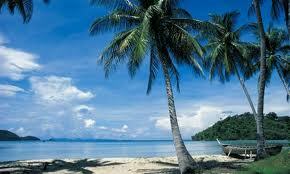 Attractions include Tha Khao Beach, about five kilometers away from the Koh Yao District Administrative Office. This beach has many colorful rocks and pebbles. As well, a short distance away from the beach is a small island called Koh Nok which can be reached on foot during low tide or by canoe during high tide. Ao Por / Yamu Cape (อ่าวปอ / แหลมยามู)Ao Por or Yamu Cape is located in the East Coast of Phuket, in close access to both Boat Lagoon and Royal Phuket Marina. The stunning scenery overlooking the numerous limestone islands of Phang Nga Bay is prominently advertised by the real estate developers setting up properties in this lesser known part of Phuket. The easy access to Phuket town as well as the boating / yachting areas will attract a different public and thus create a new destination. There are currently not too many developments there, but rather hi-end quality ones, with more to be developed by international investors. As yet still a bit away from the crowds, Yamu will rapidly gain momentum in the years to come. Naka Yai Island (เกาะนาคาใหญ่)Naka Yai Island used to be a rather simple destination with mainly a small fisherman village on the West. In the meantime, major developments are seen to be made resulting in hi-end hotel properties. The island is therefore becoming more of a exclusive destination than what it used to be. The stunning views in the East towards Phang Nga Bay are simply stunning and most of the fine white sandy beaches are currenly occupied by day - trippers from Phuket. Lazying in the sun and swimming are pretty much the only activities on Koh Naka and due to the scarcity of restaurants, one may consider bringing a picnic along if planning to stay during the whole day. Although most of the visitors are coming as part of a day trip around Phuket and many a boatload of siwmmers and snorkellers are generally stopping off at some point during the afternoon off the Eastern coast. The most direct access to the island is with longtail boats which can be hired at Ao Por pier. Accommodations are about to be completed, so mainly still a day trip destination.